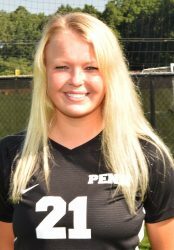 Hallie Hedman is one of Penn Girls Soccer team’s strongest players, but in the 2017 season, Hedman suffered a devastating injury that would cut her season short. Hedman, a center back for the Kingsmen, suffered a torn peroneal tendon at the beginning of the 2017 season. Hedman tore her peroneal tendon during practice when she stepped in a hole and twisted her ankle. Hedman heard a pop, but being the strong player she is she thought nothing of it and kept practicing. Hedman had no idea that this would cut her season short. Hedman, who has committed to play soccer at Holy Cross College, still was able to help her team out even on the sidelines. “Sitting on the sidelines was very eye-opening to me. I was able to learn from my teammates and spot where the mistakes were and communicate to them in order to help them succeed,” Hedman said. Hedman was heartbroken at the fact that she was out for the rest of the season, as well as not being able to start in the 2017 state championship game. “It was hard for me to wrap my head around that I would never be able to play again with the seniors and I wouldn’t be able to play the rest of my junior year,” Hedman said. Hedman’s recovery was an excruciating amount of time. The entire healing process took 10 months and she wasn’t able to put any weight on her ankle for two months. Hedman’s teammates supported her all throughout the healing process. “My team made it so I was a part of the team and included me in everything. The coaches also helped and arranged for me to be able to go to everything,” Hedman said. Hedman was ecstatic to be back on the field but didn’t feel she was at her full potential yet. “When I got back on the field for the first time, I felt so happy, but yet I felt lost because I hadn’t played in so long and I was just getting back in the hang of things. My foot was still weak and it took me a while to build my strength back up,” Hedman said. Hedman has now recovered and is ready for the rest of the season.